I got a little Slutty on our National Holiday when I heard that Slutty Vegan came to Harlem NYC. 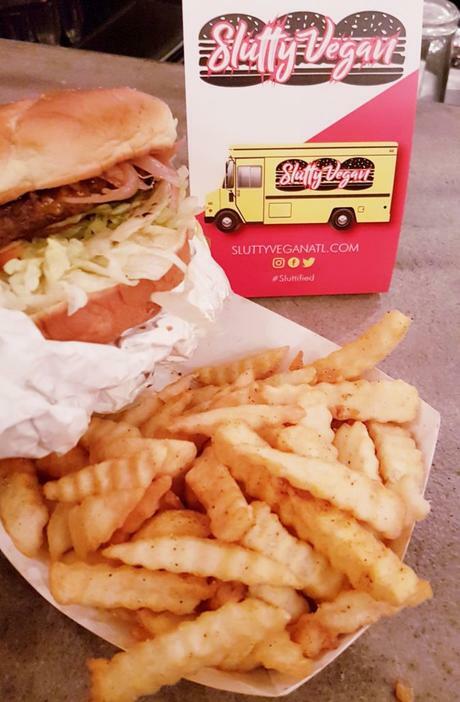 Slutty Vegan, an Atlanta based fast food company specializing in fast, and yummy plant-based foods, held their first pop-up in New York City ever. Their menu places a shining spotlight 100% Vegan versions of the All-American fast-food favorite, the hamburger. It's irresistible, insatiable, forever side-piece, french fries. I went with an open mind to try something new and exciting and to have a little fun. And I didn't leave until I had a One Night Stand. No pork, just vegan bacon. 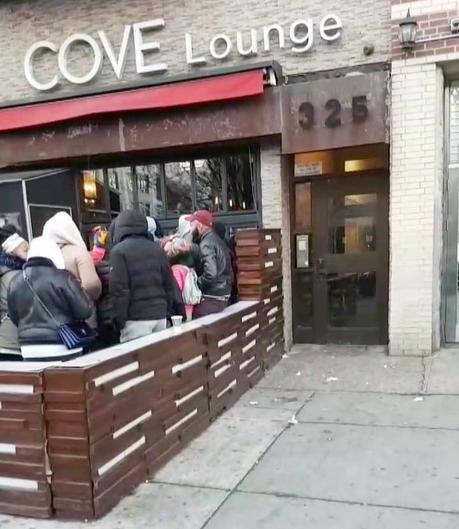 The outstanding pop-up event, held at the Cove Lounge in heart of Harlem, was a kickoff to the larger Slutty Vegan Tour. It will stop at a number of major cities along the East Coast in celebration of the Grand Opening of their new brick and mortar location in Atlanta - 1542 Ralph David Abernathy Blvd. Back in New York, with lines wrapping around the block for hours. Over 900 people were served a taste of these delicious and satisfying burgers. We came to get the stuff that's so good we waited in the cold for it! Impossible Burger patty loaded with pickle, vegan cheese, caramelized onions, lettuce, tomato, and slutty sauce on a vegan Hawaiian bun. Impossible Burger patty loaded with jalapeños, vegan cheese, caramelized onions, lettuce, tomato, and slutty sauce on a vegan Hawaiian bun. Impossible Burger patty loaded with vegan bacon, vegan cheese, caramelized onions, lettuce, tomato, and slutty sauce on a vegan Hawaiian bun. If you've never had an Impossible Burger - you don't know what you're missing! If you are steering your diet to be more plant-based right now, start here! The Impossible Burger Patty is made of a proprietary mixture of wheat, potato proteins, coconut oil, and heme. It tastes so much like meat, that you will open your burger, thoroughly examine how beautiful the patty is, whisper sweet devotion while you put it back in the bun and ravish the whole thing. 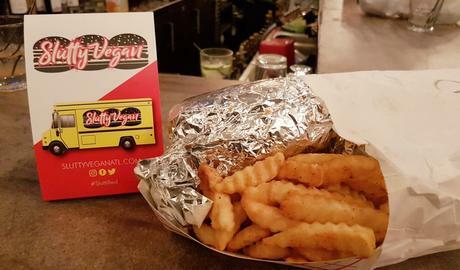 Founded in 2018 by Pinky Cole in Atlanta Georgia's West End community, the Slutty Vegan Dream Team started with the purchase of a restaurant-grade food truck. The goal was to provide fresh, top quality prepared vegan comfort foods to an area underserved by flavorful vegan eats. A reminder and benchmark to everyone across the country that plant-based eating can be absolutely delicious and affordable. The Slutty Vegan tour went on to Baltimore, DC, and Maryland, Greater Georgia, New Orleans, Houston, and will end in Los Angeles at the end of March 2019.